T he site has been messed up due to server changes I wasn’t aware were happening. But don’t worry, Jesus is busy fixing it as we speak. 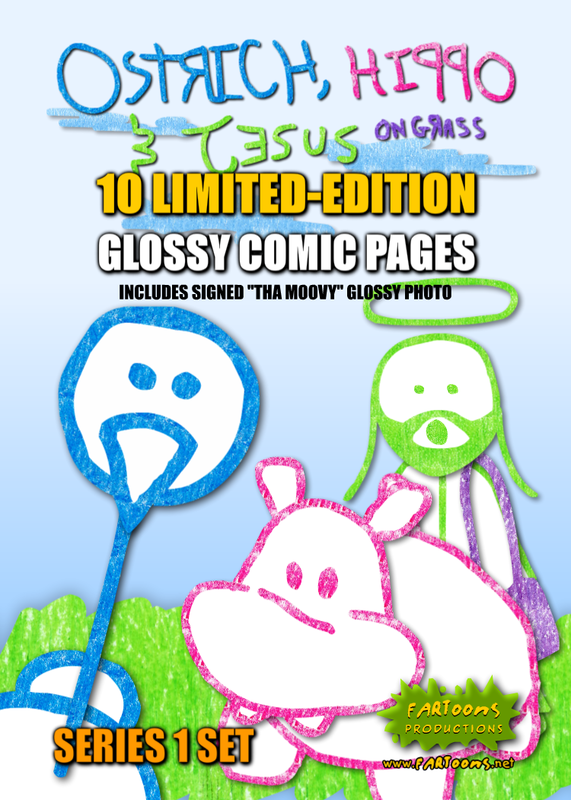 Limited-edition “Ostrich, Hippo & Jesus on Grass” glossy comic pages are now available in the online store. Collect all three sets! Once these are gone, they are gone forever. The #0001 edition will be available at Quimby’s Bookstore in Chicago later this week. I put out some free DVDs, Blu-rays and glossy cards at Star Clipper and Vintage Vinyl in St. Louis today. I am sure the DVDs are gone by now but there will still be glossy collectible cards.